The stylish Soundcraft LX7ii Mixer gets its looks from the highly successful and popular MH3 and MH4 touring sound consoles. The Soundcraft LX7ii 32-Channel Mixer includes a new frame, module ID graphics and end-cheeks, making the LX7ii system not only easy to use but the envy of professionals everywhere. Electronically, the LX7ii has a Soundcraft mic preamp and EQ section, both designed by Soundcraft founder and electronics wizard Graham Blyth. The 4-band EQ with swept mid sections is based on the highly acclaimed EQ in the MH3 and MH4 touring consoles. The GB30 mic pres on the Soundcraft LX7ii mixer possess much of the quality and precision of the mic pres used on Soundcraft's biggest touring desk, while still being cost sensitive. The GB30 EQ gives a steeper than usual slope on the fixed LF and HF sections, removing unwanted mid-frequency "mush" and delivering a clearer sound. It is a cost-effective design that brings high-end EQ into an affordable mixing console for the first time. 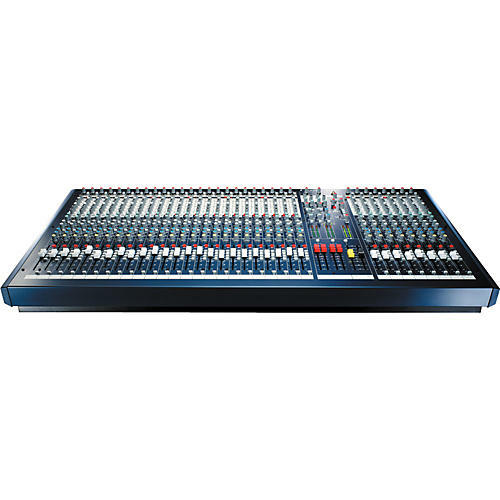 Other standard features of the RW5676 LX7ii Mixer include 32 mono inputs and 4 stereo inputs/returns with 4 groups, main stereo output and a dedicated mono output for centre clusters. There are direct outputs on the first 16 inputs suitable for multitrack recording, and 6 auxes providing flexibility for effects and foldback. The LX7ii mixes to 7 outputs-4 subgroups, plus the main Left, Right and Center (Mono) mix outputs. This mixer continues the tradition of the highly successful original LX7 in its applications in live performance PA, installed systems in churches, theaters and any similar application where a compact-sized console needs to provide a large number of inputs and maximum output capability. Both recording and live applications are easily satisfied with the Soundcraft LX7ii 32-Channel Mixer.